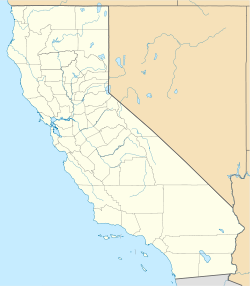 Guasti, formerly known as South Cucamonga and Zucker, is an unincorporated community in the Cucamonga Valley region of the Pomona Valley, in southwestern San Bernardino County, California. Guasti is located 3.5 miles (5.6 km) east of downtown Ontario, near the Ontario International Airport. The community changed its name from Zucker to Guasti after Secondo Guasti, founder of the Italian Vineyard Company, which operated in the area. The Guasti post office opened in 1910. Guasti has a post office with ZIP code 91743. The first post office in the community opened under the name Zucker in 1887 and closed in 1900. ^ Inside The Inland Empire: "The Wineries of Rancho Cucamonga are back. ", 9 May 2007. ^ Durham, David L. (1998). California's Geographic Names: A Gazetteer of Historic and Modern Names of the State. Quill Driver Books. p. 1424. ISBN 1-884995-14-4.